This year, Trinity celebrates its 60th Anniversary, so the Director of Communications asked me to incorporate images created in Adobe Illustrator into the Flash movies on the home page of the site. 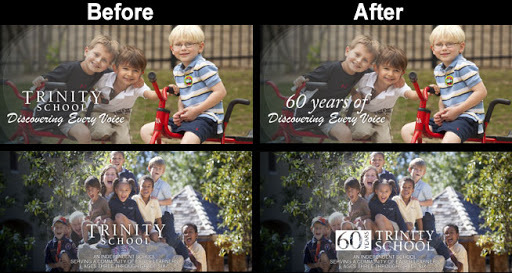 To do this, after importing the .png files (“60 years of” and the “60 Years Trinity School” graphic logo) into Flash, I converted each one to a movie clip, added a glow filter, keyframed it, and created a motion tween. I love new projects and opportunities to learn new things. And I especially love being able to complete projects that would otherwise cost Trinity more money (about $300-$500 for our web developer to do this particular one). There are 10 movies in all on the home page, 3 sequences with 3 movies each, and one final frame (the one with the graphic logo). The video shows just one of the movies, and the final frame.